As cooler weather is now upon us and autumn is in full swing, most of us have now switched on our central heating to warm our homes. Autumn and winter are when we rely on our boilers the most and as such, it’s when our boilers work the hardest. Follow our top tips for boiler health to ensure your boiler keeps you warm this winter. Getting your boiler serviced regularly is vital to keep it in great working condition. If you haven’t had your boiler serviced yet this year, book an appointment with a Gas Safe Registered engineer. Your engineer will clean all the parts and components in your boiler and check that they are all in good working order. An annual service is also usually required to maintain your boiler’s warranty. Even if you don’t feel the need to have your heating on regularly yet, it’s beneficial to switch it on for short periods from time to time to check everything is working correctly. Keeping your heating off for long periods of time during warm weather means then when you do switch your heating on, your boiler has to work harder to warm up. Keep your boiler manual in an easy to find place to use as a quick reference guide over the winter months should you need it. You boiler can lose pressure over time which may impact on its efficiency. Topping up your system pressure is a quick and easy job; you can find instructions on how to do this on manufacturers YouTube channels; the Ideal Boilers’ video can be found here: https://www.youtube.com/watch?v=6O7fkg1ROVM. You can also find instructions in manufacturer’s installation manuals and if you are unsure, ask a Gas Safe Registered heating engineer for help. A key way to keep your heating system healthy is to regularly check your boiler for leaks, cracks, clunking noises or black, sooty marks which may indicate your boiler may need to be checked by a Gas Safe Registered engineer. It’s also important to check outside your home to ensure any external vents, flues and airbricks are not being blocked by debris. The flame in your boiler should be a strong, clear blue colour. If it appears yellow or smoky, there could be something wrong and you should call a Gas Safe Registered heating engineer immediately. During the cold winter months, the external condensate pipe on your boiler may freeze and stop your boiler from working. This can be prevented by using pipe insulation or keeping the heating on a constantly low setting when it’s very cold. If your condensate pipe does freeze, you can defrost it by pouring tepid water over it. Many boiler manufacturers also have videos showing you the best way to do this. As with all gas burning appliances, boilers can produce carbon monoxide, a dangerous gas that is colourless and odourless. If you think your boiler may be faulty it should be checked by a Gas Safe Registered heating engineer as it may be producing carbon monoxide. Every home should have a carbon monoxide monitor. 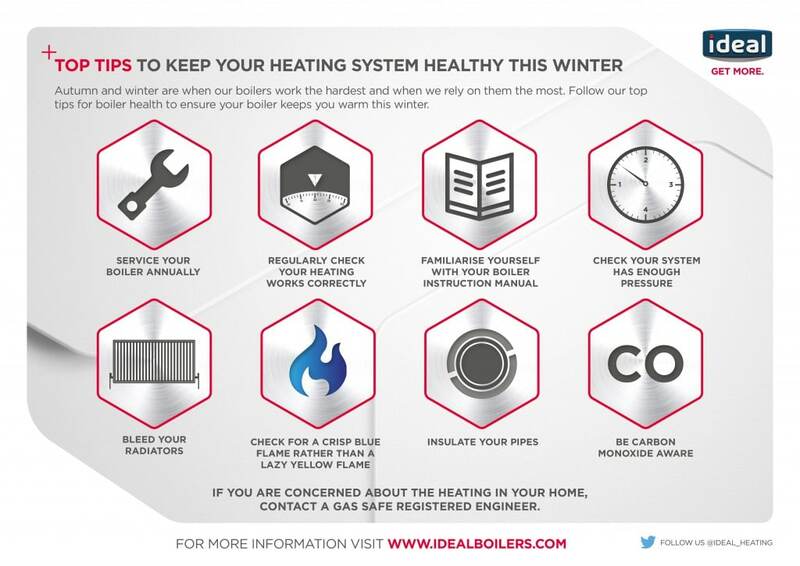 Keeping your heating system healthy, particularly over winter will help keep your home safe and warm. Regular maintenance will also make for a more cost effective heating system as your system will be running more efficiently.